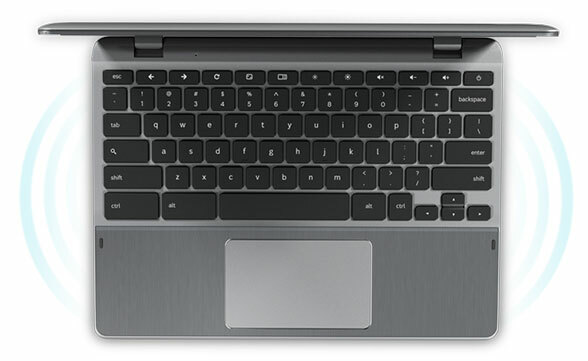 I am certainly convinced that the Chromebook would integrate seamlessly into my classroom, and after chatting with educators on Twitter it seems clear that the Chromebook also offers teachers a great opportunity to eliminate printing and move towards a model of online editing/grading, etc. My school eliminated paper notices years ago, with all information and fliers disseminated to families via email or the school blog, so paperless paper writing seems a logical next step. As a 5th Grade English teacher I have some concern over how well I can communicate grammatical edits to my students via an online comment, but I'm game to give it a try! Last term my classes spent a month using Google Docs to write personal memoirs, but I had students print out a hard copy of each draft and turn it in to me for a line-by-line editing. At the time I felt pretty strongly that my students needed hard copies, with hard edits, in order to improve their typing and writing skills. Now, I'm not so sure. I have a suspicion that older students with a firmer grasp of writing skills will have an easier time sticking to an online format of submission and revision, but I'll know more soon enough. When we return from winter vacation my students will do a 'mini-publishing' of one of their Writer's Notebook entries, and I plan to use that assignment as a pilot for going green and doing all work in the cloud. For use as a primary personal computing device, however, I think transitioning to a Chromebook would be difficult, particularly because I have not yet transferred all of my files to Google products. For example, I use Microsoft products for work email and 90% of my word processing needs. My appointments are in iCal, my music in iTunes. While iCloud, Drive and Google Music offer workarounds for accessing these items, it would still require a total commitment to Google in order to make the Chromebook my one and only device (Those Googlers have a killer game plan, here). I'm certain there are folks out there who already use Google for everything, and I'm sure more will move in that direction now that the Chromebook, with its appealing speed, cost, battery life and clean design, is an emerging contender. While the Chromebook is not yet appealing to me as an actual replacement for my Macbook, it was a much more desirable choice for idle internet usage. When in bed, on the couch, or in need of a quick Google search, I repeatedly found myself choosing the Chromebook over my Macbook, iPhone or iPad. And when traveling, I again chose the Chromebook over my other devices, as it offered a nice balance of the functionality of a laptop (keyboard, large screen) with the size of a tablet. My sense is that right now, Chromebooks are being considered for school devices more than personal computers, but I'll be very curious to hear from folks who switch over to the Chromebook as their main computer (I know one Googler who intends to do just that, and I eagerly await reports from him about the transition). In the meantime, Kevin Purdy at IT World has written a really excellent piece about this very issue, addressing nearly everything one needs to know when considering a Chromebook, including those concerns about iTunes, printing and Microsoft Office. Anyone considering a Chromebook would be well served by reading Purdy's The Big List of Chromebook Work-Arounds and Caveats. As a 5th Grade English teacher, I ask my students to use laptops quite frequently. During the last three weeks of school my students spent nearly all of their class time in GoogleDocs, drafting, editing and revising their personal memoirs. The beauty of GoogleDrive was immediately clear, as students could easily access their writing from home or school and complete pages of their memoirs from any computer. The only challenge we faced in class was in regard to the slow boot up time for our school netbooks, which due to some combination of age and processing speed, ate up a good 10 minutes of class time before students were ready to get to the work of writing. The Chromebook is so incredibly fast, both in terms of boot up time and browser loading, that I can easily see gaining back that class time previously lost and giving my classes a few extra minutes (and far less frustration!) for working. It is also the case that, as our school computers are PCs, we needed to remember to use Chrome when working from GoogleDocs in order to get a full complement of features. I devoted a class period to teaching my students about Chrome (what it was, how to find it on their machines, the omnibar, etc.) but my 5th Graders would periodically forget and start their day's work in IE, which had a limited array of features (nothing terribly significant, although accessing fonts, spellcheck and adding printers were all a bit wonkier when using a browser other than Chrome). With a Chromebook, the lack of choice when it comes to browsers would actually be a plus. While I am mostly sold on the Chromebook as one of the best options for student computers (given its price point, ease of use, speed and simple interface), the greatest challenge I've come across thus far is printing. I've been using my Chromebook at home, where my Macbook is already set up to print wirelessly. I assumed setting up the new device to print would be relatively easy, but that was not the case. Chromebooks require a cloud printer, which I do not own. If I did want to print from my Chromebook, I would need to follow these steps. The workaround involves logging into Chrome from my home computer, and linking my Chrome accounts with my existing printer. I'm sure it's doable, though it felt like more trouble than it was worth given I already had a computer that allowed me to print from home. This does, of course, raise a different issue for these as school devices. Adding printers is already a time consuming process at school, particularly for the younger grades who haven't yet mastered the many steps involved. I'm not sure how we'd work out printing at school, and I wonder if the hours necessary to setting up cloud printing would be the best use of our amazing tech team's time. As I pondered the issue of printing with Chromebooks, I checked in with a few GTANY colleagues, and their input definitely points towards a greener future. Jason Markey, a principal in Illinois who rolled out 3500 Chromebooks at his school, chose to NOT enable printing on any of them. The choice was made not only because of the hours that would have been necessary to set up cloud printing, but also because it offered an opportunity for the school to discourage and move away from the wastefulness of endless student printing. Amy Mayer, who works with a school district in Texas, also finds printing an ever rarer occurrence but both Jason and Amy have backup systems in place (printing via email or desktop) for those times when students have to print. I'm interested to share these details with my school as we continue the conversation about the best device for our students! You can read more about Jason's Chromebook Rollout and Amy's Chromebook Tips by following the links. Today our technology director asked me if I'd like to take home a Chromebook to play around with over the winter vacation. Of course, I immediately ran downstairs to the tech office to check out the device and start using it. I've become increasingly convinced that Chromebooks are the next big thing when it comes to student devices, and ever since I used one during the Google Teacher Academy I've been imagining how they might change the landscape of my classroom. Lightweight My excitement over having the device for the next two weeks was only slightly dampened by the thought of lugging it home this afternoon along with all the other classroom items I intended to clear out before winter vacation. Of course, the instant I actually picked the laptop up I realized these concerns were misguided. The Chromebook is incredibly lightweight. I was barely aware of it in my backpack as I walked the 3+ miles home. Macbook Air is on notice. Processing Speed These things are fast. I mean, I knew they were fast. Everyone talks about how Chromebooks, with their SSDs and web apps, boot and load quickly, but seeing this with my own eyes really cemented the significance of this feature. The entire operating system feels as snappy as the Chrome web browser does. My students devote a fair amount of their class time to booting up netbooks, logging into their accounts, opening Chrome and logging into Google Drive, so the possibility of streamlining those processes and giving minutes back to writing and instruction is very appealing (more on this in future posts). Keyboard The keyboard took some getting used to, as it uses a slightly different layout than my Dell Latitude or Macbook. For example, where my Macbook's lower left corner is devoted to four keys (FN, CTRL, OPT and CMD), on the Chromebook I have only CTRL and ALT. And, as a very keen student immediately pointed out while looking over my shoulder, the Chromebook keys are lowercase, a classy nod to the convention of lowercase letters in URLs. Finally, a nice touch is the top row of keys that mimic the buttons of my browser -- I can move between web pages, reload and minimize the browser all from my keyboard. GUI When I first used a Chromebook back in October, I found the browser-only interface claustrophobic -- my impulse to minimize Chrome and view my desktop kept creeping up, and the inability to do so was a little frustrating. The desire for a desktop is fading though, as at school we use Drive for all our writing and my students rarely need to open up Word in order to do some writing. I think the change in UI is an issue of familiarity and not functionality. Battery Life My Chromebook was fully charged at 1:45pm. I spent 3 hours working on the device and another five with it asleep in my backpack, and my battery is still at 50%. The Chromebook literature claims an 8 hour battery life and so far that seems legit. My 5th Graders spent their first semester of English immersed in a project based learning experience. September and October were devoted to deep readings and critical analysis of a variety of mentor texts, including Cornelia and the Audacious Escapades of the Somerset Sisters as well as several short pieces by a variety of authors including Patricia Polacco and Jean Little. As students read these texts, they paid particular attention to each author’s unique tone and writing style. Class discussions centered around discovering themes within the text and making personal connections to the stories being told. Students used Writers’ Workshop periods to compose short entries in their Writer’s Notebooks, inspired by the mentor texts they were studying. For example, after reading In November by Polacco, the 5th Graders shared their own holiday traditions, choosing one or two personal memories to write about in their notebooks. By November, the girls had both a broad understanding of the tools writers use to engage readers, and a rich collection of personal stories to further develop and revise. Our memoir writing began with a brainstorming activity in which students mapped out the significant people and places in their lives, jotting down a few important details about each. Students then examined their notes, looking for the common thread that ran throughout their important memories. From there, the hard work of drafting their vignettes began. The girls worked tirelessly, writing every day for two weeks in order to produce their first drafts. 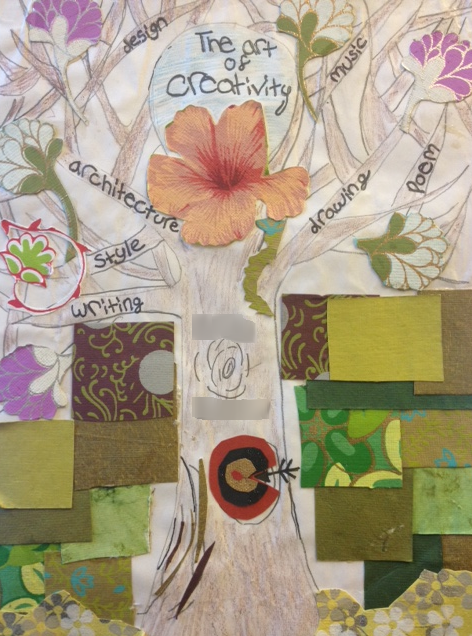 The writing process was personal to each student, as evidenced by the breadth of stylistic choices the girls made. Some vignettes were a single paragraph while other went on for pages, some were written in prose and others in verse. Regardless of these differences, each completed memoir was an authentic representation of its author. As they wrote, students took advantage of many resources to enhance and strengthen their work. They consulted thesauruses, mentor texts and their Writer’s Notebook in search of the perfect word or phrase. They paged through family photo albums, looking for inspiration and reminding themselves of forgotten details from their early years. The girls conferenced with me, edited with their peers, and ultimately produced three distinct drafts of writing in order to present their published memoirs. Throughout this process, the 5th graders were also tasked with creating the beautiful book jackets in which their memoirs now sit. 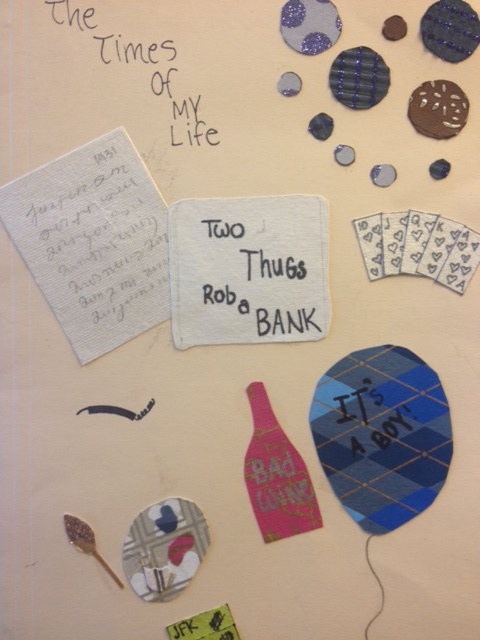 Given only simple guidelines (include a title, author and illustration), each student produced a unique book cover that is representative of their personal style. A few nights ago I encountered the most mind-blowing intersection of technology and customer service. I was using my Jetblue American Express card to buy a holiday gift via phone, from a restaurant located on the opposite side of the country. I recognize this set of circumstances is basically one giant screaming red flag: A purchase was made in California, using a credit card based in New York, and the card itself was not present at the time of the transaction. I suppose it's not so shocking that Amex picked up on this abnormality and put a hold on the card, but the what happened next is what really impressed me. I received an email saying the credit card company suspected fraud. The email asked me to call a customer service number to check out the charges, which I did from my iPhone. The automated operator on the other side of the line asked for all the usual forms of credentials, and then offered to text message me with a link to the suspected charges. This SMS came in while I was still on the call, and it suggested I switch to speaker phone. What came next was an amazing feat of synchronization: All of the sudden, the automated operator was aware of the fact that I was looking at the link Amex had sent me. The phone call and the web page I was viewing synced up, so that when I clicked "Approve Charges" in my browser window, the operator confirmed via phone that the charges were OK. I have already come to expect pretty great customer service from both American Express and Jetblue, but I sat in total awe of the magic that went on before me as they ensured there were no erroneous charges on my card.